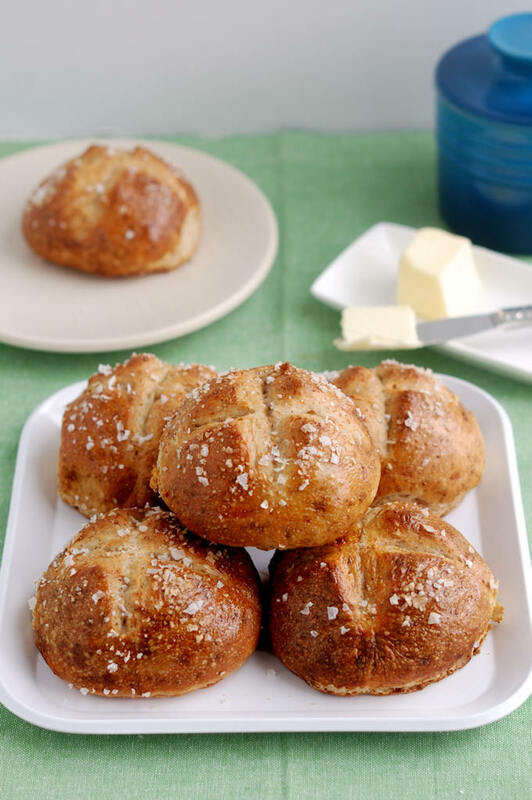 A hint of barley malt syrup and a bit of stone ground rye flour give these Malt & Rye Pretzel Rolls a slightly sweet and complex flavor. The flavor really stands up to the extra “pretzely” crust. 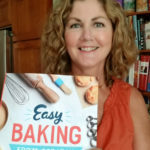 What’s the secret to that great crust? Read on…. The first time I saw pretzel rolls in our local market I immediately snagged a few to bring home. I’m a big fan of pretzels in all forms. I love the dark, pleasantly-bitter flavor of a good pretzel crust. What is it exactly that makes the crust taste like a pretzel? The shaped dough is dipped in an alkaline liquid before baking. Commercially and traditionally the alkaline used might be lye. 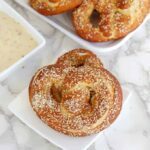 But, being that lye is quite caustic, most home bakers turn to baking soda to create the pretzel dip. 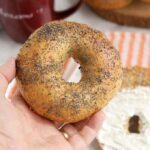 I’ve use a baking soda solution for all of my pretzel recipes (Sourdough, Pumpkin Spice Ale and Bavarian Beer) and my New York Bagel Recipe. I love all those recipes, but it turns out there’s a way to make them even better. The setup for dipping the rolls. 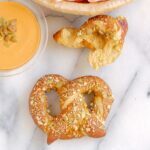 Dipping is what gives the rolls the “pretzel” crust. 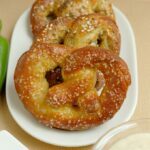 In the article, Mr. McGee explains how to make the best pretzels at home. You can read the article for all the background and details. 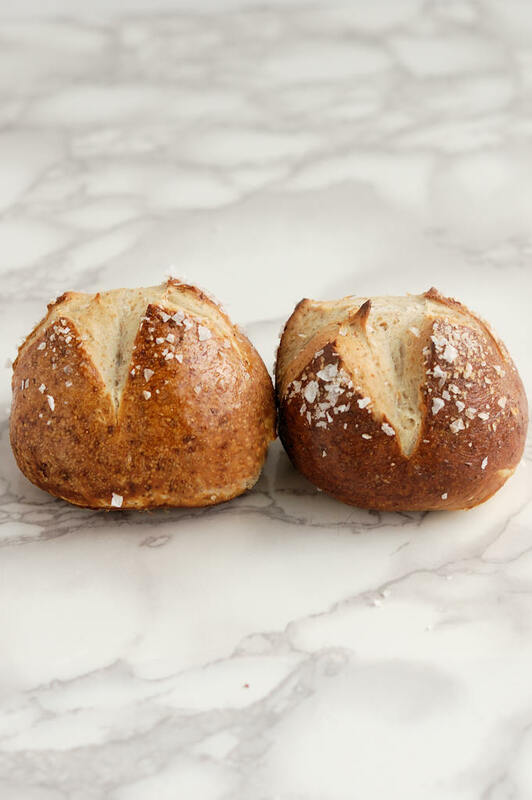 But the gist of it is this, baking the baking soda will make it more alkaline, which will give our Pretzel Rolls a deeper color and more of the “pretzely” flavor. 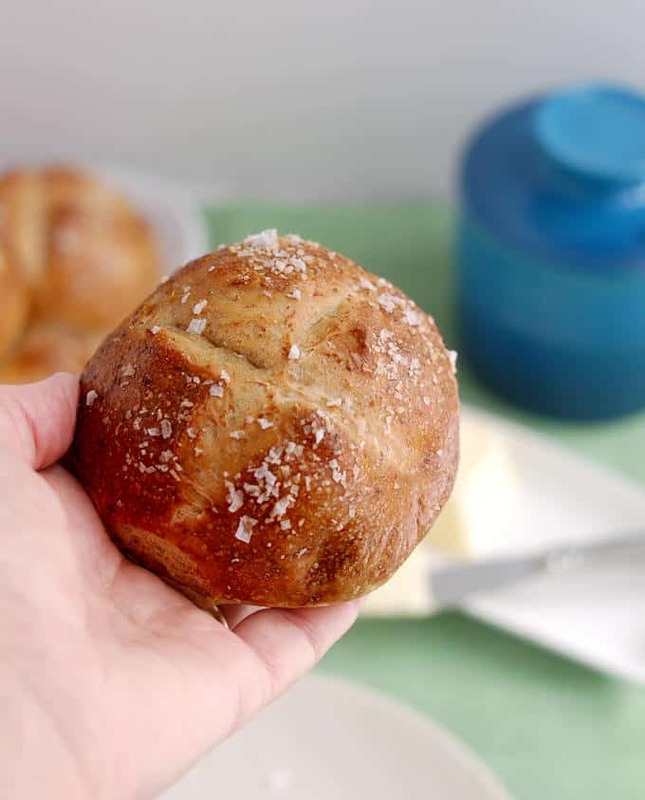 If you’ve ever had them, you know that pretzel rolls generally have a soft white crumb with a simple flavor. Honestly, the rolls are usually all about the crust because the bland interior crumb really doesn’t stand up to the flavorful exterior. As long as I was working on the recipe I decided to amp up the flavor of the bread itself, was well as the crust. I made the first batch with a basic white bread recipe and the rolls tasted fine, but a bit bland. For the second batch I added a little rye flour and got a better flavor. For batch number 3 I added the barley malt syrup which gave the bread a slightly sweet flavor that balances nicely with the slight bitter crust. 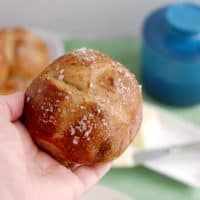 Speaking of the crust, I also compared rolls dipped in a “baked” soda solution versus a solution made with baking soda straight from the box. As you can see from the following photo, the baked soda definitely made a deeper brown crust. The “pretzel” flavor” was definitely more prominent as well. The roll on the left was dipped in regular baking soda solution, the roll on the right was dipped in “baked” baking soda solution. 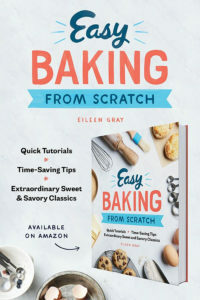 If you think that the extra step of baking the soda is more trouble than it’s worth (you’re baking bread from scratch so you probably don’t!) you can use plain baking soda instead. Bring a quart of water to a boil and add 1/3 cup of baking soda. 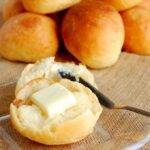 Dip each roll into the boiling water for 30 seconds, then drain, rise and bake as directed in the recipe. The won’t be quite as “pretzely” but they’ll still be delish. 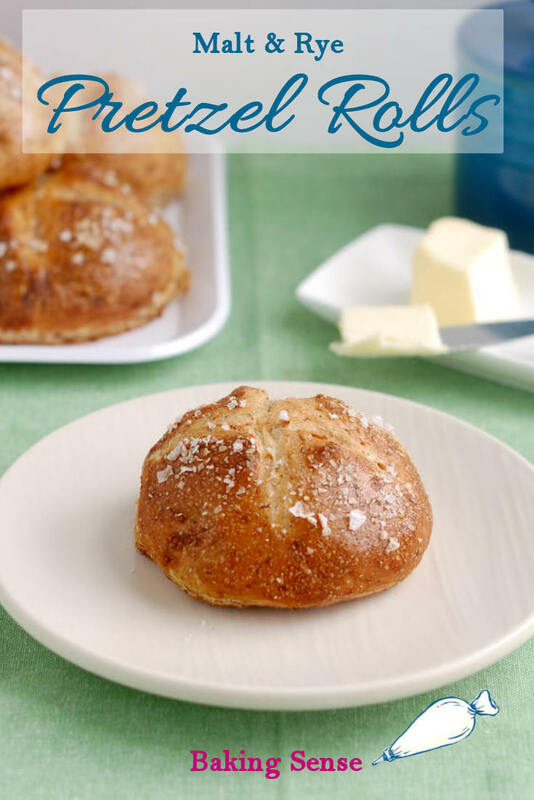 Often pretzel rolls have a soft white crumb with a simple flavor that can be overwhelmed by the crust. 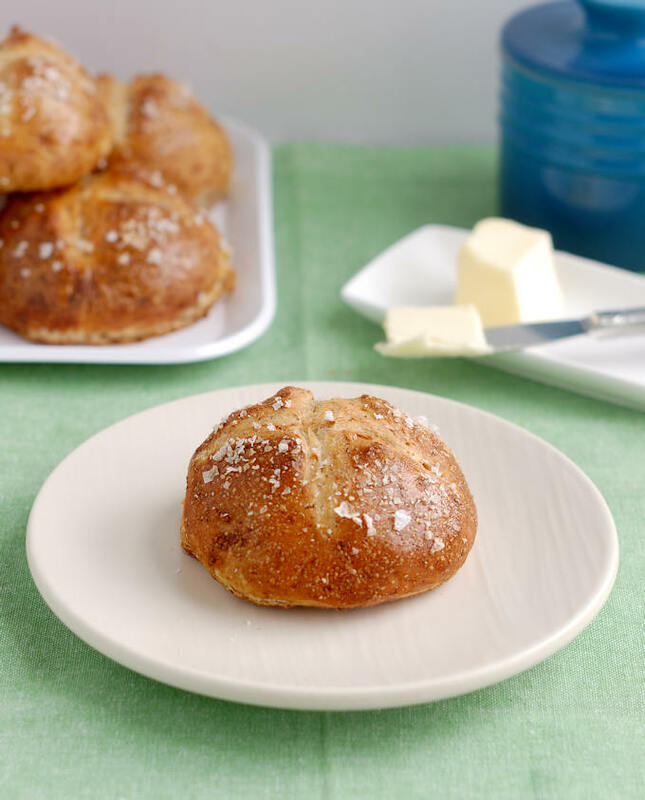 Malt & Rye Pretzel Rolls have a slightly sweet and complex flavor that compliments the extra dark, distinctively "pretzely" crust. 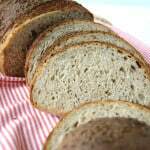 Combine the water, butter, yeast sugar, rye flour and 2 cups of the bread flour in a mixing bowl. Mix to form a thick batter. Cover the bowl and set it aside for 30 minutes. If using a stand mixer, switch to the dough hook. Add the salt and remaining bread flour and mix until the dough gather on the hook and clears the sides of the bowl. If the dough is very sticky and doesn't clear the sides of the bowl, sprinkle in a few more tablespoons of flour. If mixing by hand, add as much flour as you can then turn the dough out and knead in the rest of the flour. Knead the dough for 5 minutes. 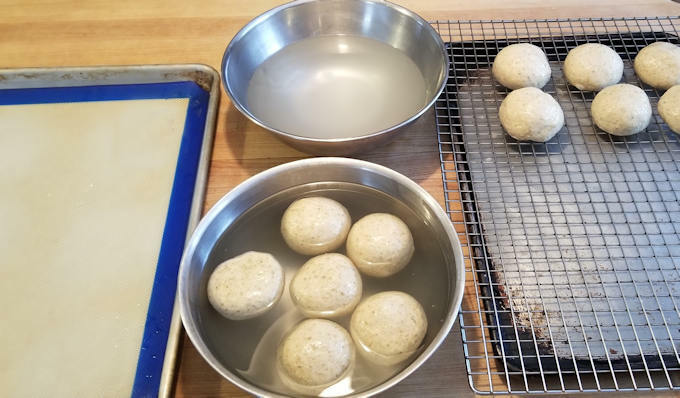 Form the dough into a smooth ball and place it in a lightly oiled bowl. Turn the dough once to coat it on all sides, cover the bowl and set it aside to rise for about 1 hour, or until doubled in size. Line a half sheet pan with parchment paper or a silicone baking mat. Turn the dough out onto a lightly floured surface and knead briefly. Divide the dough into 12 pieces. Use your cupped hand to roll each piece into a smooth ball. Set the rolls onto the prepared baking sheet. In a large bowl combine the "baked" baking soda with a quart of warm water. Fill another bowl with plain water. Set a cooling rack next to the bowls. 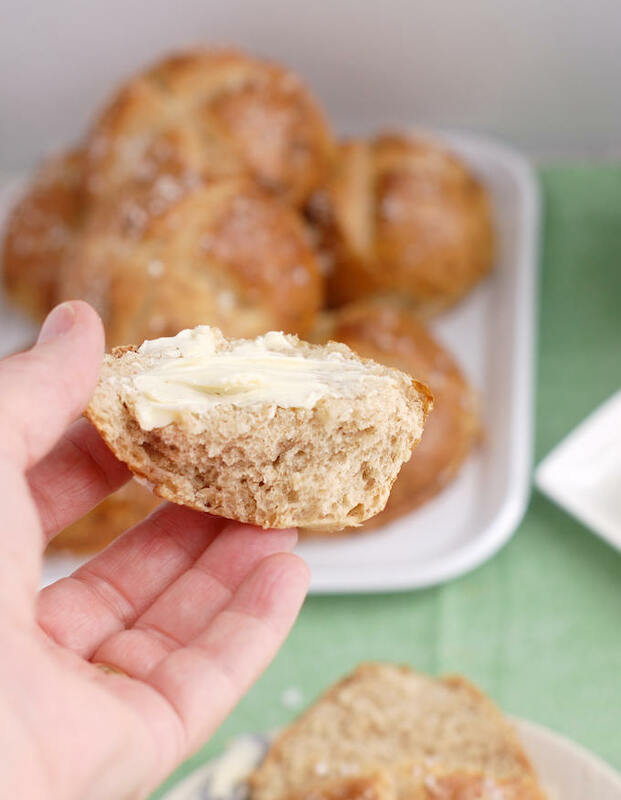 Place as many of the rolls as you can fit into the bowl of baking soda water. Allow them to sit for 3 minutes, flipping them half way through. Dip each roll into the clean water to rinse and then set it onto the cooling rack to drain. Continue until all the rolls have been dipped. Transfer the rolls back to the parchment lined baking sheet. Cover the pan with a damp kitchen towel and set aside to rise for 30 minutes. Preheat the oven to 425°F. Use a sharp knife or razor to cut a 1/2" deep "X" in the top of each roll. Brush each roll with egg white and sprinkle with kosher salt or coarse sea salt. Bake until deep golden brown, about 15 minutes. The extra alkaline baking soda can be slightly irritating so avoid prolonged contact with your skin. To work ahead, bake the soda, cool and store in an airtight container until ready to use.